Not sure if harvesting is the right solution for you? Dredging may be the answer. Not only is Inland Lake Harvester a leader in aquatic harvesters, as a division of Inland Dredge Company we also have over 30 years experience in dredging, shoreline management, pond construction and waterway development. 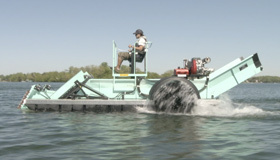 We invite you to visit Inland Dredge Company for more solutions to waterway management. With over 30 years of experience in waterway management, Inland Lake Harvesters has developed the ultimate solutions to manage any waterway. Our attention to detail and superior craftsmanship has been refined to produce the strongest built, longest lasting aquatic harvesters on the market. At Inland Lake Harvesters we do not build for obsolescence. Our harvesters feature stainless steel belting on conveyor #1 and Heavy Duty Galvanized Belting on conveyors #2 and #3. Our propulsion systems uses a direct-drive, heavy-duty hydraulic motor directly coupled with the tapered shaft, hub and keyway. This advanced design overcomes the problems of gearbox and chain driven systems that require constant rebuilding and replacement. We also offer an optional environmentally-friendly hydraulic fluid/oil to help keep your lake and waterways safe. Every part counts, and that's why all of our harvesters and harvesting accessories are manufactured with the highest degree of skill and integrity. After all, your harvesting program is only as effective as the tools you're using. At Inland Lake Harvesters we believe those tools should be designed to have the simplest maintenance with the longest lasting parts available. Every part counts, and that's why all of our harvesters and harvesting accessories are manufactured with the highest degree of skill and integrity. 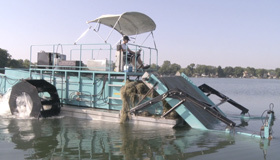 Both floating and submerged aquatic weeds (such as Hydrilla, Water Hyacinth, and Eurasian Milfoil) are easily mitigated using Inland's harvesters. However, creating the best plan to manage your waterway the right way is an in-depth process benefiting from years of experience. At Inland Lake Harvesters our experts are here to help you get the job done right with over 30 years of hands-on experience and our vast knowledge of waterway management. We will analyze your waterway needs to ensure that your harvesting program will shine using the best equipment on the market and backed by the most comprehensive support in the industry. With our harvesters in operation across the globe, Inland has always made safety our No. 1 concern when it comes to our customers and our equipment. Standard features in our designs include a full tower platform from the operating area to the rear fuel and hydraulic reservoirs as well as safety rails and chains to help prevent users from accidentally going overboard. Additionally, the hull of our machines are built with full bulkheads that greatly increase hull rigidity as well as creating many more watertight compartments. Call Inland Lake Harvester today and let our experts work with you to determine the right course of action to manage your lakes and waterways.